It’s pushing 11:30, and I’ve had a busy and productive day. I should be curled up in bed – it’s right there, after all, soft and cozy and less than two feet away – but instead I’m writing in the ol’ blog. There is a reason for this, though. I’m practically choking to death on burned popcorn fumes. Delicious as popcorn is, the smell is another story. Even when it’s cooked perfectly, that aroma – which hangs around longer than an unwanted houseguest over the holidays – permeates the atmosphere and practically seeps into your pores. Kind of like bacon; delicious on the palate, but boy does it overstay its welcome on the nose. 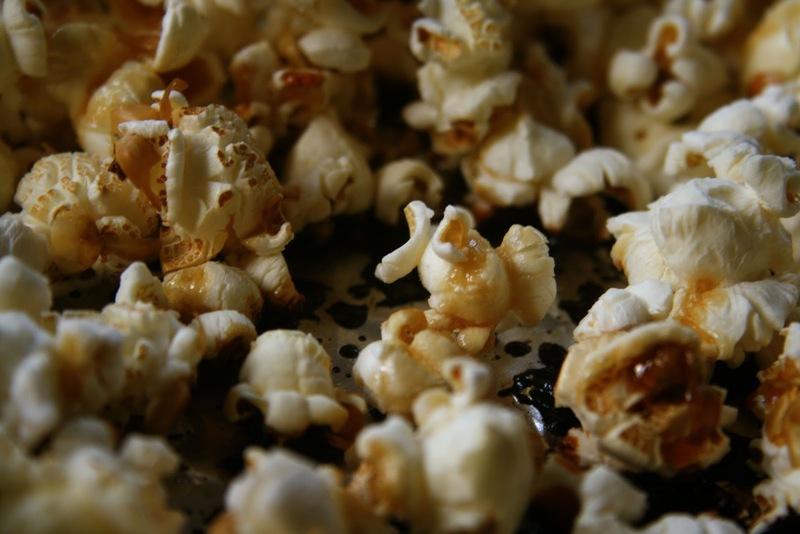 Burned popcorn is twice as nauseating, and the smell lingers four times as long. Admittedly, I’ve had issues with stovetop popcorn in the past, but nowadays I’m an expert at making it. In other words, I am not to blame for this latest fiasco. I was, in fact, upstairs in my bedroom, chatting away with Tara on the phone, when I first noticed that the house smelled like it was on fire. Fortunately this was not the case, but I learned later it nearly was the case; Rusty had decided to make himself popcorn, but had either forgotten about it or had the heat up too high or something or other – the exact details disappeared in a haze of teen-excuse-speak – and it doesn’t really matter anyway; all I know is, at one point he carried a smoking pan of popcorn outside in order to prevent a possible raging inferno. I suppose I ought to thank the boy rather than chastise him for the awful smell that is still here hours later. You know what, though? It’s Christmas Eve Eve. I should have visions of sugarplums dancing in my head, but instead I close my eyes and see flames creeping up the stairway. Do you have any idea how hard it is to sleep when every inhaled breath fills your nostrils with the acrid odor of scorched popcorn? It’s going to be a long night, folks. By the way, this is the second time Rusty almost burned the place down. Just a few days after moving here in 2006, I smelled something burning one morning before work but couldn’t locate the source. After a fruitless search I dismissed it as paranoia and nearly walked out the door, but it was so strong I decided to make one more sweep of the premises. That’s when I found his bedspread, half off the bed and draped over a nightlight that was missing a cover. The bulb had burned a hole in the bedspread. Had I just gone to work that day without double checking the house, I’m convinced at some point I would have received a very unpleasant phone call from the fire department. In all fairness, I too once nearly set my townhouse afire. I was frying chicken in a cast iron skillet, the oil got too hot, and – woosh! Hello, grease fire. Thankfully, I was smart enough to disregard my first instinct to throw water on the burning pan, and instead covered it with a lid. A close call, but honestly, at the time I was more upset that I had ruined that last batch of chicken. Because it had turned out really good. I sure hope my insurance agent isn’t reading this post, by the way. Otherwise my premiums might just skyrocket. Like I said, today was pretty busy. I hit Target for some last minute Christmas items, mostly stocking stuffers, though in truth I hadn’t gotten my parents gifts yet, and to make matters worse I had no idea what to get them. I figured I would wander the aisles hoping for inspiration. Fortunately, it struck. They are just so damn hard to shop for! And whenever I ask them what they want, it’s always the same response: “You don’t have to get us anything.” I know they think that’s helpful, but it sort of isn’t – of course I’m going to get them something, unemployment be damned! You know what I love? When you hit upon the perfect gift idea for somebody. A week ago, I thought of an incredibly awesome and appropriate present for Tara’s mom, Tracy. The only problem is, I had to do some scrambling to put it all together, and I didn’t get it mailed out until this very afternoon. Too late to make it there by Christmas, but I’m hoping she appreciates the thoughtfulness and – let’s face it, modesty be damned, the sheer, unbridled genius of this present enough to overlook the fact that it’ll arrive a few days late. And yes, I know, I didn’t have to get Tracy a gift either, but you think I’m going to turn down an opportunity to impress my girlfriend’s mother? Not a chance, people. Next week, I’ll be busy trying to impress Tara’s friends and her dad’s side of the family, only I won’t have any cool gifts to rely on – just my charm and wit. So, this is it. Christmas Eve is 35 minutes away now, and I’m as ready for the holiday as I’m going to be. All the shopping is done, the presents are wrapped, and we’ve gone through our entire collection of holiday movies save for one or two. Saturday afternoon, we head to my aunt’s house in Oregon for our now-traditional Russian dinner, followed by It’s A Wonderful Life when we get home. Just me and the kids. I’ve already told them there will be no popcorn. Then it’s Sunday. Christmas Day. Up early for presents, breakfast with my parents, drop the kids off at their mom’s house, and a few hours later I’ll be deposited at the airport, ready to embark upon my first airplane ride in more than a decade. In a mere 42 hours, I will be in Las Vegas. In 48 or so, Ely. What a pleasant surprise. Waking up and seeing a post from one of my favorite writers!! Woohoo….Christmas came early folks!! I’m not going to repeat one of my facebook comments so I’m just going to leave it right there. Now, the burnt smell of popcorn. Ewww gross!! At least with good popcorn, the smell is enticing. Even if the popcorn is just a tad burnt, the whole batch tastes like it. Yeah. Not a good scenario by any means. What I dislike is the smell of Italian sausage. Spicy Italian sausage. That particular smell sticks around for 3 or 4 days and all the candle-burning, air-freshener spraying and the opening of windows will not alleviate it. Which is why David is the proud owner of a George Foreman grill and can cook it outside! Have a wonderful Christmas, Mark! Oh, you’re right. Italian sausage is also in-your-face and lingers forever. Sure tastes good while you’re eating it, though. Did I ever tell you about the time I worked at Target as a cashier? I was sick and asked to go home…the Supervisor told me to finish my line and close up. The next lady up had been trying on cologne (shopping for her husband) and I could smell it… that wasn’t what got me though, you know what did?? The snack bar burned the popcorn!! Yeah, the smell is awful and that was all it took for me to throw up on the cash register. Most embarrassing moment of my life…. OMG…you vomited on a cash register?!?! I hope the drawer was closed, at least!! Merry Christmas to you, Mark! Remember to imbibe an airport-bar Bloody Mary (expensive…but they’re super-skimpy on the flights). Good luck, have fun, and enjoy my state! I was thinking of doing both, Mikalee! I promise to enjoy Nevada…I just wish it would snow once during my trip. Not looking good for that. Oh well, I’ll have a blast regardless. Have a most joyous Christmas! You know I’m not going to resist playing this now, right? Red 13. One bet. It’s on. And have a merry Christmas! I know how you’re feeling. I started a fire in the fireplace a few weeks ago, but the flue was closed. I ended up having to open every window and door to air the place out and I still felt like I was asphyxiating hours later when I went to bed. Oopsie. But really, who among us hasn’t done that at least once in our lives? So don’t feel too bad, Margaret. Just wanted to stop by to wish you a faaaaaaaaaaaaaaaabulous Christmas, buddy! Have an awesome and safe trip! Can’t WAIT to read all about it! Say Hi to Tara for me! Your charm and wit will be more than enough to impress the fam. Besides, you already have a leg up considering the ex was seriously lacking in the social skills department. You are awesome through and through and everyone is going to love you. Just six more hours before Jara’s Joy is cruising south on Highway 93. See you soon, babe! Did you know the Indians taught the Pilgrims to make pop corn ? Took a while longer for the movies to come about. Irony is that most early movies were about shooting Indians who gave us popcorn in the first place . Glad I’m not the only one to nearly torch my own place. Hope your dinner still turned out good.